"I made up this dip years ago and have found through the years that family and friends request this in football season every year." 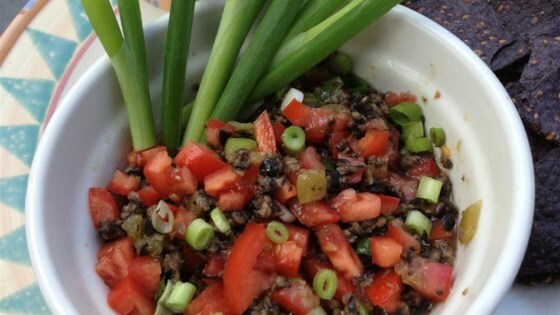 Mix tomatoes, black olives, green chiles, green onions, olive oil, vinegar, and garlic salt in a bowl. I have made this recipe for over 40 years. The only difference is I use 1/3 cup Wishbone Italian dressing instead of oil and vinegar. It's wonderful! best if refrigerated over night. Amazing dip!! So easy and a big hit with everyone!